Theatres 3 and 4 are both located in Inglewood, CA. Inglewood has a bad reputation because of its inclusion in the gangster rap genre, which is unfortunate. It's history is deep and rich and, luckily for time travelers such as myself, full of architectural reminders of another era. I like to think of Inglewood not as a crime-ridden caricature of itself, but as the place where Brian Wilson was born, and the town who erected a statue -- albeit a rather small statue -- in memory of a loyal dog in front of the downtown post office (get out your magnifying glass for the plaque reading, it's worth it). 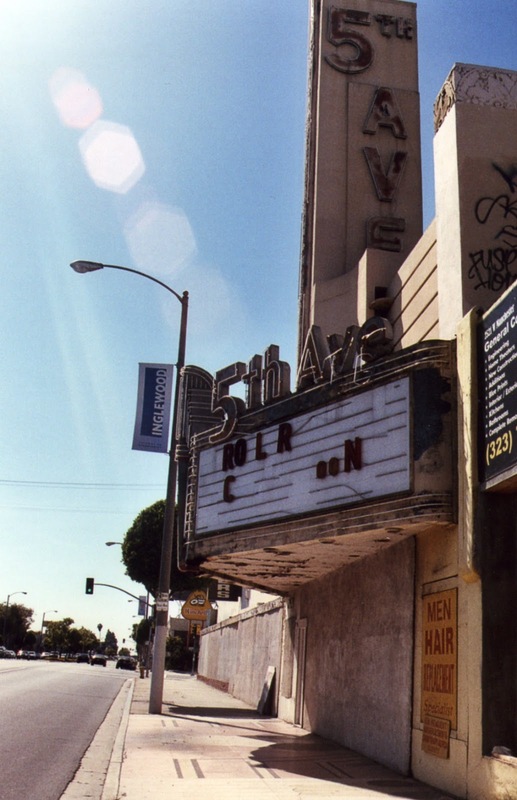 The 5th Ave Theatre is at 2541 W. Manchester Boulevard. 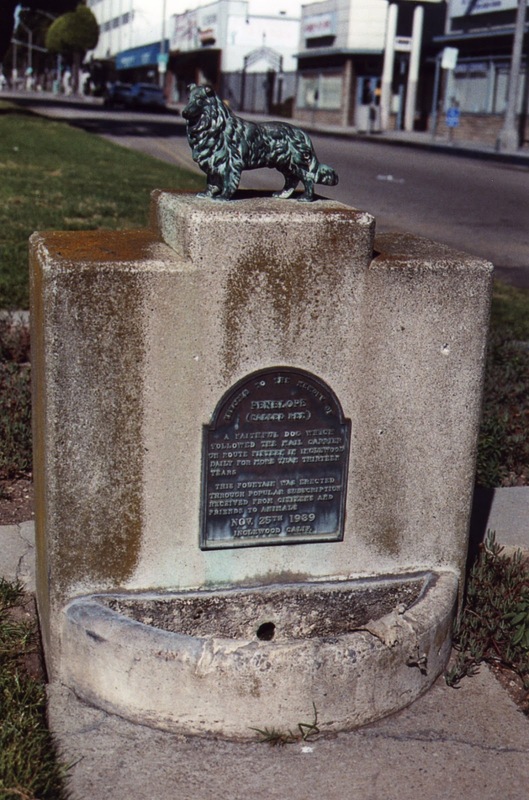 It was built in 1939 (the same year as the nearby Academy, which will be featured in a later post) and has been closed since the 1980s. Closed since the 80s is going to be a trend with these posts. The 80s were dark days. The condition of the 5th Ave is heartbreaking. What was once a brilliant marquee is bent, broken, and destroyed by rust to the point that rainwater collects the iron and drips methodically onto the marble of the tiled sidewalk, eating it away. The building is an eyesore, covered in tagging and stucco (and I HATE stucco!) and if you look closely enough you can almost see it slumping over, depressed. It's just so sad. It's made worse, I think, by the fact that there's not any chance that the 5th Ave's grey clouds are going to clear up. It doesn't have the breathtaking spire of the Academy, or the incredible interiors of the Fox. At the same time, though, there's no reason for it to be razed. The corner of Manchester and 5th is far from a real estate hotbed, so it seems that the 5th Ave will keep sitting and waiting for now. The Fox Theatre in downtown Inglewood opened in 1949 on the site of the Granada Theatre, which burned to the ground in December, 1945. The theatre was last operated by the Mann chain and in operation until the -- wait for it! -- 1980s. 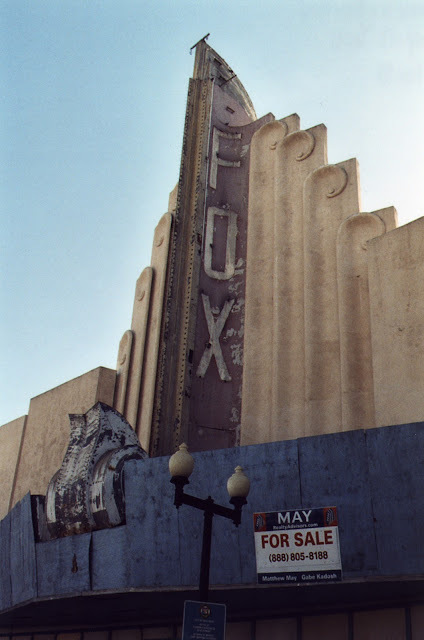 Unlike the 5th Ave, the Fox is still in decent shape (some recent interior photographs are available at the theatre's Cinema Treasures page) and has a dedicated group of local preservationists fighting for it. One more thing about Inglewood -- it's the home of Randy's Donuts. 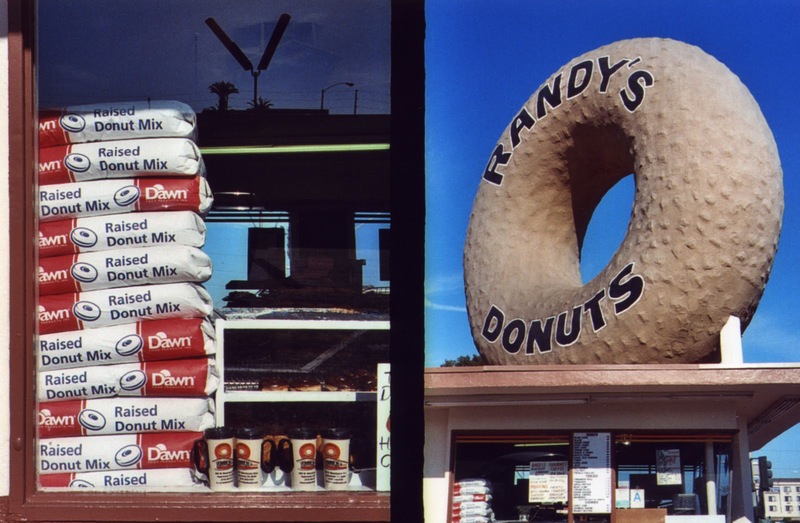 Not the only giant donut on earth, but likely the most infamous. My morning coffee tastes better than ever out of my Randy's travel mug. I think this is as good a time as any to mention the Los Angeles Historic Theatres Foundation. Visit their website, become a member, and attend their fantastic tours. Coincidentally the next tour is a week from tomorrow, at Hollywood Blvd's El Capitan. It's absolutely worth getting up at the crack of dawn on a Saturday for. I like it..good job..keep it up! Re: marquee @ 5th Ave. -- According to Cinema Treasures blog post, the 5th Ave's marquee once read "Roller Derby Coming Soon". That was several years ago.